Hugo is a nice static web site generator, suitable for blogs and much more. 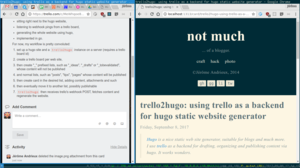 I use trello as a backend for drafting, organizing and publishing content via hugo. It works wonders. hugo is written in golang. It is fast (when compared to jekyll for instance), it is simple and well, the website is here to tell you more about it. the build being hosted on github pages. I wrote something about this workflow a while ago. hugo is however not limited to this very convenient and quite hacky workflow. Its features are quite extensive, from menus, sitemaps, shortcodes and such allows for a lot of use cases and with some creativity, even “quite dynamic” websites. trello is more difficult to describe. It is said to be a “great tool to organize your life”. 10m users and rocking. trello provides their users “boards” that contain “lists” (columns) that contain “cards”. The user experience is great whether it be the browser and mobile apps or the REST API, with its collaborative, “near real time” and open features. “Cards” are the atomic content, with id, name, markdown description, attachments, checklists, due date, members, votes and labels. Pretty much what’s needed for a “post”. “Lists” are “cards” containers, with a id, name and a sorted collection of “cards”. Pretty much what’s needed for a “group” or a “status”. “Boards” are a “list containers” with a name, members and various parameters that makes them a good fit for a “web site”. 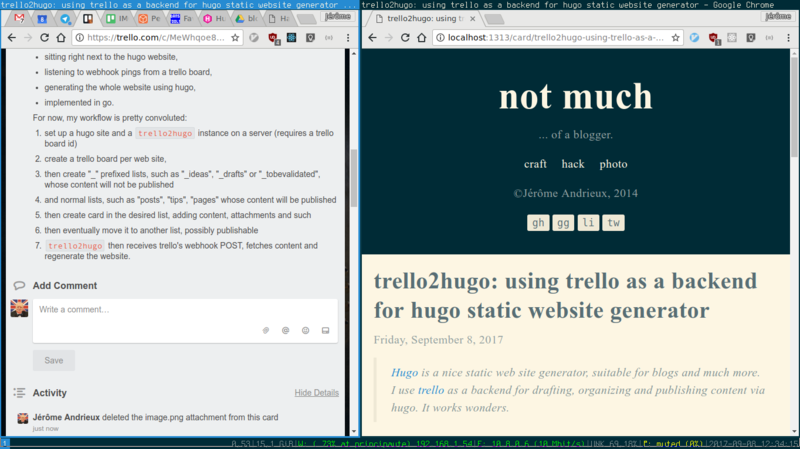 trello2hugo then receives trello’s webhook POST, fetches content and regenerate the website.